Herbalista recognizes healthcare as a fundamental human right and provides free clinical care to underserved communities. We also sponsor herbal education, empowering folks to care for themselves and their neighbors. We strive for a community-based model of healthCARE that is based on solidarity and not charity. We hope you will join in our mission of building community through herbalism! The Herb Bus is a mobile clinic and classroom offering free herbal care in Atlanta, Georgia and around the United States. Since the winter of 2012-2013, the Herb Bus has been defending our right to vital and verdant healthcare …. The Herb Cart is a mobile clinic providing free, herbal care to communities in need around the Atlanta area. This service learning program is a unique training opportunity for emerging herbalists looking to expand their clinical skills …. Providing free herbal care and comfort to marginalized communities around Ireland, the Herb Bike offers streamlined clinical services and specializes in alcohol-free remedies. Currently serving the cities of Dublin and Cork …. Herbal Medicine is the oldest and most widely used form of medicine in the world! This Community Herbal Clinic, located in East Atlanta, offers sliding scale consultations and custom compounded remedies …. Join us at our monthly community Health Fair for free health services, wellness classes, and a spot of tea. Join us the last Wednesday’s of the month for true community healthcare– by the people, for the people …. The Harriet Tubman Free Foot Clinic combines conventional and herbal therapies to care for the feet of those experiencing homelessness. All services are free thanks to the help of our volunteers and to generous donations …. 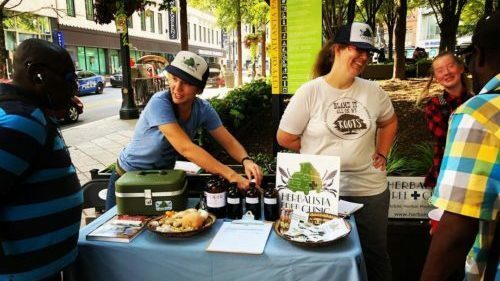 Promoting herban-agriculture in the Atlanta area, Grow A Row encourages skill sharing and seed swapping! We welcome farmers, schools, and individuals who want to join us as we create herbal infrastructure to support our community …. The land around you is chock full of edible and medicinal plants – even in the urban landscape. Join us at these seasonal plant walks to learn basic plant identification and botany skills, medicinal uses for urban weeds, and more …. These mini-health stations offering folks a chance to care for themselves and their community with herbs and vitamins. Establishing HerbCare Stations helps bring herbs out of the shadows and into the hands of the people …. Combine service with learning in these exciting workshops! 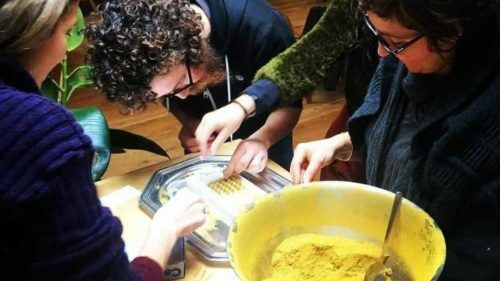 Build your medicine making skills while you help us create sweet, sweet herbal remedies to share in the community with folks who need it most …. Are you looking to offer community healthcare and build your local herbal infrastructure? Do you have a vision to serve but want a little help with the nuts ‘n bolts of your grassroots project? Herbalista can help …. The Herb Kitchen is an Atlanta based herb project, providing health education and herbal events. The Herb Kitchen brings herbal medicine out of the shadows and onto your kitchen table …. For a city that prides itself on the egalitarian legacy of Dr. King, we have also become the city with the largest income inequality in the United States! This type of contradiction is all too common, with rhetoric often not matching the reality. Even within the Herbal Community, where we point to the failure of our conventional medical system to provide adequate and accessible care, we sometimes recreate the very same problematic model, where only the privileged few have access to herbalists. The Herbalista Free Clinic was an attempt at a different way of doing things. 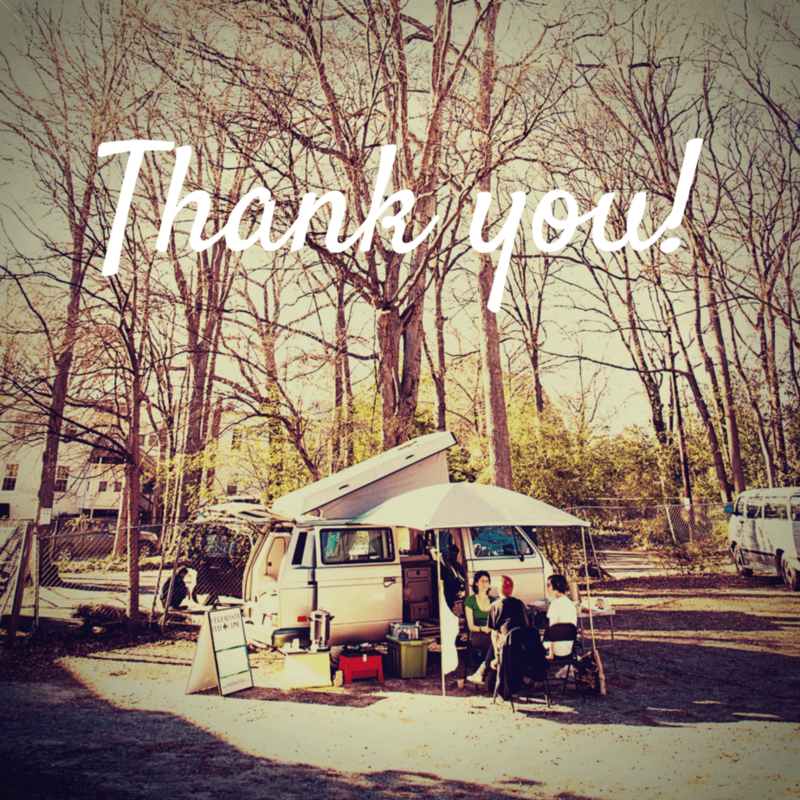 We started serving Atlanta in February of 2013 from a VW camper van. Nicknamed the Herb Bus, we had a vision of utilizing mobile medicine as a means of providing earth-based care to underserved communities. By freeing the clinic from the confines of brick and mortar, we managed to lower our overhead costs, expand treatment capacity and unleash our creativity. Oh, how we 💚 mobile! We schedule regular stops around town to offer free clinical care, a spot of tea, and herbal education. Over the years our services have expanded to include the Herb Cart, the Herb Bike, a Community Health Fair, and numerous HerbCare Stations. We strive for a community-based model of healthcare that is based on solidarity and not charity. Our programming is built to share skills, keep costs down, and give us all the chance to share our love through service. Medicine Making Workshops, the Grow a Row Program, and Plant Rambles not only keep the apothecary stocked and the clinics rolling, but have helped cultivate an extended community care network. We see improved health outcomes, stronger support networks, and a growing vitality that comes simply from working with plants! To help folks wanting to build their own communities herbal infrastructure, we’ve loaded this website with resources, including the Herbalista Toolkit and several “how-to” manuals. While the Herbalista Free Clinic has a focus on serving the homeless and other vulnerable and marginalzed populations, we also recognize that under the current established models of healthcare in the U.S., we are all under-served! So long as the medical and governmental structures prioritize pharmaceutical medicine and surgical intervention, the people are being denied their right to health. Herb and food based tonic therapy have always been a necessary part of human evolution and survival. Access to health care is a human right and our mission is to providing the tools, encouragement, and lived examples of how we can take back this basic right. The Herbalista Health Networks welcomes students, volunteers, partners, patients, clients, guests, and friends of any race, color, national or ethnic origin, religion, economic strata, ability, sexuality, and gender-orientation to join us! We believe in diversity, not discrimination! We are herbalists, not licensed medical doctors, and do not diagnose or prescribe. We work WITH our clinic guests and value an open, honest dialogue about their current concerns and health goals. We do our best to help them achieve those goals. We are both thrilled and humbled by the opportunity to serve the people, the plants, and the planet. Much appreciation to the communities who welcome us into their folds, love to the friends and family who share our journey, and gratitude to the mighty crew who holds it down in the ATL and now Dublintown to make it all possible.